Remember the days of Disney vacationing when you had to go through all that hassle of waiting in lines, being bludgeoned by the rush of crowds stampeding to the FastPass machines of the new hot ride, or breaking out your nunchucks just to secure your spot for your favorite fireworks show or parade? Remember excruciatingly reaching all the way around to your back pocket for your wallet so you can get your hotel key/park ticket card out every time you wanted to go into your room or enter a theme park? The old system being phased out consisted of a card. On that card was your room key, theme park tickets, and your credit card (if you chose to add it to your card.) The new system consists of a wristband. On that wristband is your room key, theme park tickets, and your credit card (if you choose to add it to your wristband.) But wait! There's more! The new wristband also holds your Photopass information! Is your mind blown yet? Yeah, it shouldn't be. So far it just sounds like they've duct taped the old key card to your wrist and called it "innovative!" Animal Kingdom entrance. 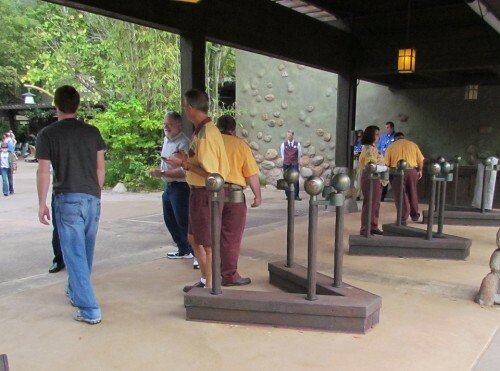 No more turnstiles. 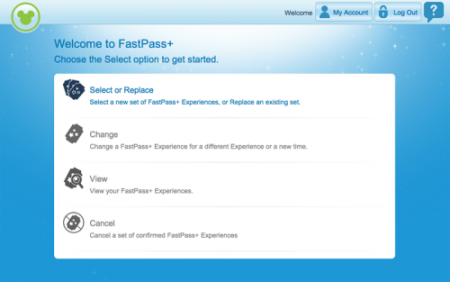 A big addition to this system is that now families can reserve a limited amount of FastPasses for rides and showtimes before they ever leave home. Some people were concerned that this wold completely destroy spontaneity, to which i say "Nay!" 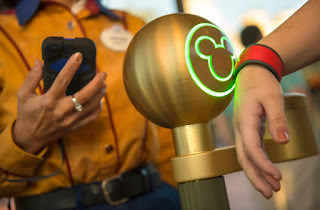 With this system is a smart phone app called My Disney Experience, which you can access at any time and move your reservations around all willy nilly. Don't have a smart phone? There are also kiosks in the parks that let you do the same thing, so your FastPass reservations aren't nailed down to a specific time and you're not screwed if you miss it. Now there have been concerns of security and privacy, especially with the children wearing these wristbands with essentially all their information and their family's information attached to it. Will Disney exploit the children and market to them? No. No more than they already do. See, here's the thing: Any information people are afraid of giving to Disney, Disney already has that information. You gave it to them when you booked your trip. They already know your address, your name, your kids' names and ages, your credit card information, how long you'll be staying, and anything else. And the old system had all this same information. Unless there's some risk not coming to my mind (and if there is, please leave it in the comments and I will address it) this system is perfectly safe. It's no more Big Brother-ish than the old system. All I can say is that if you're going to Disney World, and have saved up loads of cash to give your family a vacation they'll never forget, don't waste your time worrying about these simple issues. You'll probably just regret the time you spent worrying. And don't let your kids lose their wristband. Another issue is how will this affect the annual passholders and locals that like to pop into the parks for an evening with no previous planning? My answer to that is...I don't know. All the details of the system haven't been rolled out yet, and it'd designed to be tweaked and modified, so I'm sure Disney has a plan for their local fan base. But honestly, the biggest issue I see from this is going to be the awkward tan line around your wrist that you're going to have to explain to everyone when you get home. Alright, that's all I have. Did I miss anything? Let me know!